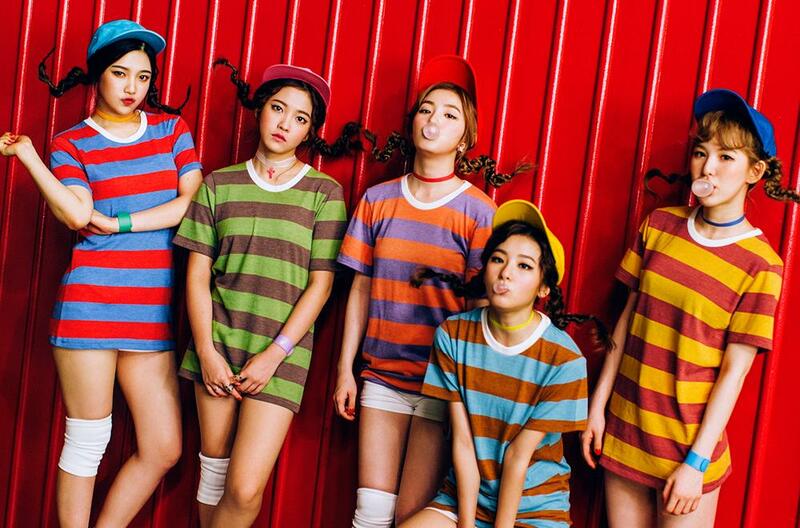 The Kpop Jungle: Red Velvet Reclaim My Heart With The Fabulous "Dumb Dumb"
Red Velvet Reclaim My Heart With The Fabulous "Dumb Dumb"
Red Velvet made a name for themselves with their previous comeback earlier this year, as they charted high with single "Ice Cream Cake" and even won first place on several music shows. I personally didn't get the hype about said song and highly preferred "Automatic", which was the other track they semi-promoted. My slight dislike for the former song and the fact that they won with it and it was so liked by so many made me sort of irritated, as I once again, like with EXO felt myself get more and more annoyed by their success. I really didn't want that to be the case (damn you SM! ), but sadly I had those kind of feelings. Now they've come back with "Dumb Dumb" and although I didn't get it at first I am now genuinely digging the song, and my relief is infinite. I know I'm insanely late with this MV review, since the girls already have promoted for several weeks and won quite a few music show awards, and for that I am sorry. That does not mean however that I don't find this video and comeback enjoyable, because that's exactly the opposite of what I've been doing. Like I mentioned previously the song didn't quite impress me at first, but after a few listens it grew on me quickly and passionately. I talked about this in my album review as well, but "Dumb Dumb" is a song that you will either love or hate, because of how it sounds and is structured. There are many twists and turns, a loud, almost borderline noisy instrumental, and high-pitched vocals mixed with SM-like rap-talking, and as you can tell it's a recipe bound for either success or failure. Personally I've grown to like genuinely like it, but it does sound better either with watching them perform it live or hearing it together with this wonderful MV. 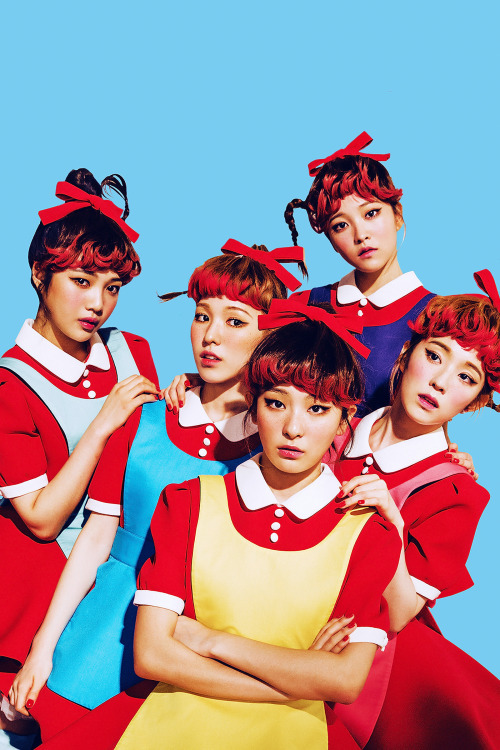 Right off the bat I knew from the teaser pictures and video that this comeback would be special. The concept was odd, creative and the right amount of quirky and charming. The doll-like dresses, hairstyles and colorful outfits looked interesting to say the least, and I must say that in terms of standing out among the rest of the girl groups they did a great job in putting together this concept. The song "Dumb Dumb" is about acting awkward, stiff and silly around a crush, and feeling like your mind and body aren't cooperating properly. Shortly put: you feel a bit dumb. The girls sing about how they feel almost like mannequins or robots, like inanimate objects unable to control themselves in when they see their crush, and this comparison is also what the video is mostly built on. I think it goes without saying that this MV is very clever and extremely visually appealing, and it shows that at least in terms of music video production SM are spending the big bucks on Red Velvet. All of their latest videos have been hugely impressive to me, because they've all stepped outside the standard K-pop formula, more or less. However "Dumb Dumb" might be the most fun out of all of them. There are just so many things worth praising about this video, and quite frankly I have a hard time deciding where to begin. Like I said the production value of this MV is off the charts, because every detail is carefully planned out and precisely shot and edited. The camerawork is brilliant, the costume and makeup department have created magical results and the sets and props are amazingly included as well. The main premise of the video, I would say, is that the girls act as previously mentioned inanimate objects, like dolls and mannequins. We see them in a mannequin-factory setting where they are being put together by machines and later packaged too, as well as repeating programmed actions such as stamping approval signs on papers. This is mixed with plenty of dancing sequences, colorful and uniquely edited solo shots and scenes of the members together in various outfits and scenarios. The general color palette of the MV is also top notch, and their editing team has managed to make it bright and vibrant without going crazy on the saturation, which makes the video so much fun to watch. The girls themselves also help bring life to it with their stellar performances and acting, but I actually think it all comes down to them suiting this particular concept really well. Seulgi in particular stands out to me while watching it, but they all contribute with their own personalities and quirks. Speaking of quirks, this video will come off as a bit random and strange to some people, and I am definitely one of them. There are scenes and sequences that will make you wonder what purpose it served, but I've found that these kind of concepts and videos are easier to enjoy if you just let go of your own logical thinking. "Dumb Dumb" isn't supposed to be taken very seriously, neither the song or video, but it's meant to be a fun, uplifting and joyful experience and I believe they've truly hit the nail on the head when it comes to that. I could probably write much more about this MV, including more details and analyses, but then I would go on forever. At the end of it though I've found this video to be this group's best one yet and one of SM's best ones this year. The visual value is fantastic, it's an aesthetic explosion to be honest, and the concept is just magnificent. I adore the set designs, the clothes (both their costumes and regular outfits), the premise, the camerawork and the editing, and all the members bring a tremendous amount of energy and dedication. I can't imagine how long it must've taken them to shoot this video and how much thought and planning it must've went into making it, but it all shows so clearly in the finished product. This, my friends, is a high-quality music video indeed.